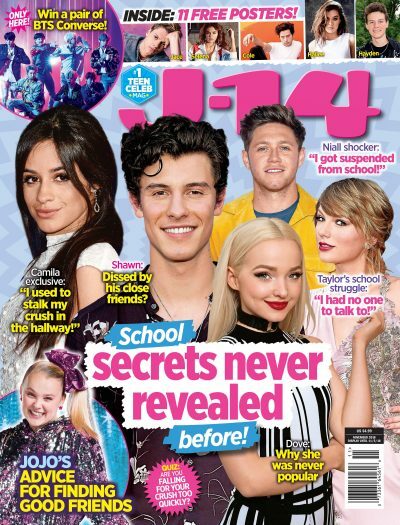 Spongebob, Patrick, and their friends from Bikini Bottom hung out on dry land with J-14‘s Liam McEwan. Well, their voice actors did! To celebrate Spongebob Squarepants‘s brand new Halloween special, Tom Kenny (Spongebob Squarepants), Bill Fagerbakke (Patrick Star), Rodger Bumpass (Squidward Tentacles), Clancy Brown (Mr. Krabs), and Carolyn Lawrence (Sandy Cheeks) answer questions we’ve all been dying to know. After playing these characters for almost 20 years, the voice actors are pretty recognizable in real life. Plus, there’s a new Spongebob meme all the time. How does it feel to be the voices of such iconic characters? Well, it’s still a little surprising! Check out the video below for the hilarious responses from your favorite underwater creatures. Not only did J-14 chat with the stars of Spongebob Squarepants, but Nickelodeon gave us an inside look at the actual set from the show’s Halloween special, “The Legend of Boo-kini Bottom.” Instead of being in regular ol’ 2-D animation, this episode uses 3-D stop motion. That means every little movement is made up of a bunch of photographs! It’s safe to say that Spongebob’s Halloween adventure is special for more than one reason. You won’t want to miss this exciting new episode of Spongebob Squarepants! “The Legend of Boo-kini Bottom” premieres October 13, 2017 at 7 p.m. ET/PT on Nickelodeon.